By Chris Isaak.. There isn't too much to say about this song other than I think it is super awesome. I like when he sings kind of quick.. Good stuff!! St. Patrick's Day nails.. Yeah, I will post mine up! I still have just under an hour to appreciate this day.. 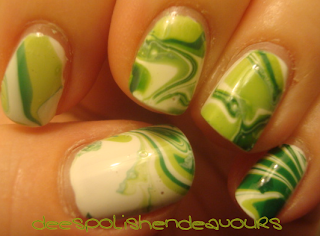 I actually watched the video posted by Dollface22772 and figured I would try this water marbling thing out. I liked it.. I didn't do it to perfection.. I have a nail that just wouldn't accept the polish and some air bubbles, but it was a lot of fun and I have gotten a bunch of comments about them just because they are different. I snapped photos of both my left and right hand.. I do apologize about my cuticles though, my hands are very dry. Work has been vicious the last couple of nights via cleaning products and such. My right hand is worse off than my left, but still not overly horrible for a first timer, right? Haha.. Oh, I used OPI Alpine Snow, OPI Jade Is The New Black and OPI Green-Wich Village. I think I am about to go take this off and give my fingers a few hours to breathe.. I'll paint something tomorrow because I have plans for Friiiiiday. But for now I think it might be sleepy time.. I am exhausted!! Goodnight all - hope you had a spectacular St. Patty's Day! Tierney - Ahh yes, I do remember that!! I had been listening to the tune for a little while and then saw it used on the show - I pretty much fainted - It was a great routine as well!! Thank you, I thought it looked pretty neat as well.. And thank you again, they are pretty adorable and I love their names as well!! Ooh, love your nails! 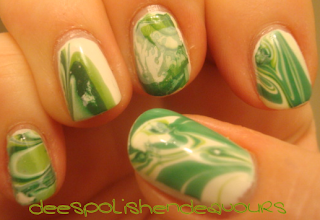 I have been tempted to try water marbling. Ooo, I love this, you did a great job!